Add videos from within a playlist by selecting the ▼ Playlist in the left navigation panel which will show us any current videos within the playlist. Then click on the ➕Add Media Button to upload any videos or create a Live Player right within the playlist. Here you can choose which type of media you would like to add. The destination playlist is already pre set by showing us the Current Playlist as the destination. To add existing media to a playlist we simply go to the desired Video or Live stream sections such as All Media. Here we click on the ☑️ left selection boxes of the videos we would like to add. Then hover your pointer to the left next side to any of the selected videos. This changes the pointer to a ⫶⫶⫶ Move Cursor. Now click and keep the mouse button pressed whilst dragging the videos to your desired Playlist. Whist dragging your videos you can see a summary of how many videos you are moving. This will permanently move the video to the selected playlist. For example if you Move a video from one Playlist 1 to Playlist 2 it will be removed from Playlist 1 and will only be available in Playlist 2. This option creates a linked copy of the video from one section to another. For example if you changed the branding of the original video in Playlist 1 it would also change the branding of the Shortcut copy in Playlist 2. Shortcutted copies are all linked to each other. Once your desired move action has been chosen you can see the videos you have added by selecting the destination Playlist in the Media navigation panel. Add videos from the All Media section simply click on the ➕Add Media button. Select your prefered media that you would like to add. Now select the Playlist you want to add your Media to in the "Save In" drop down menu. Click on the green ⬆︎ Upload or ⨁ Create button to finish. 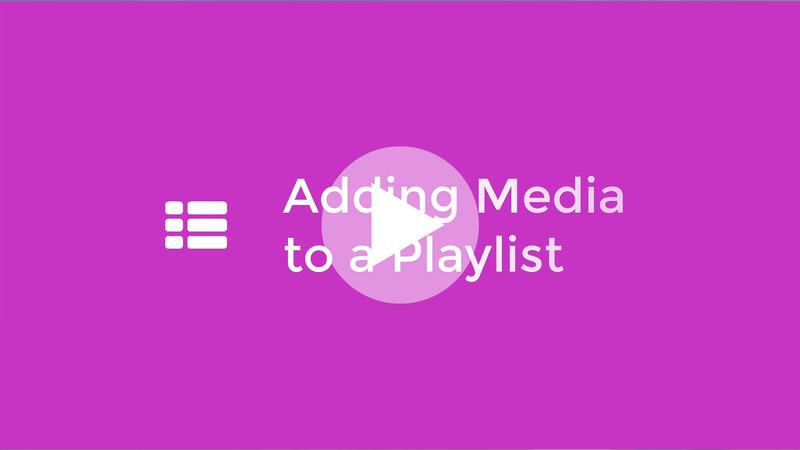 Now that you have create a Playlist and added media to it, you are able to publish it to your viewers.